Barack Obama was president of the United States for eight years, during which time he dealt with racism from many of his constituents and unprecedented partisanship in Congress. After being been succeeded by a man who questioned his citizenship even though he probably can’t spell “illegitimate,” the former president is somehow still expected to mend the fractures in this country. Being nostalgic for a time when there wasn’t a white supremacist in the White House is understandable, we suppose, but let’s maybe let a retired president just retire? 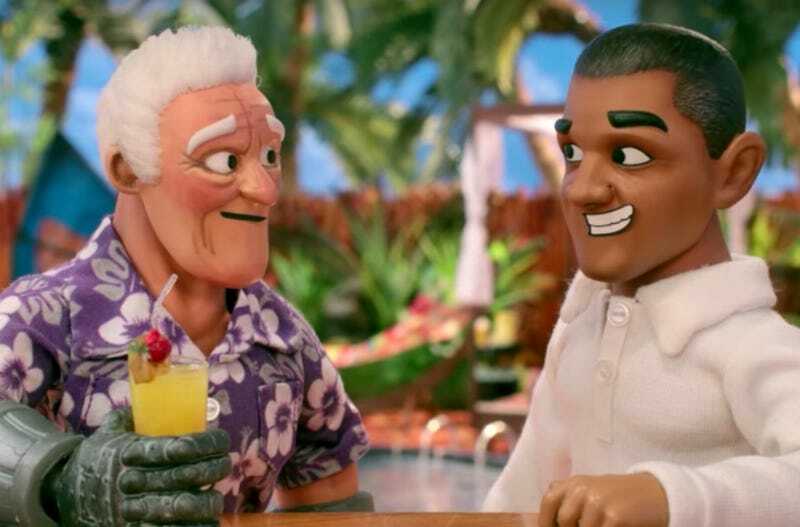 That’s what SuperMansion imagines in the upcoming “Summer Vacation Special,” in which the now (relatively) private citizen lives it up in Hawaii. In this exclusive clip, Saturday Night Live alum Jay Pharoah reprises his role—vocally, anyway—as the 44th president of the United States, who challenges Titanium Rex (Bryan Cranston) to a drink-off. The spliff jokes aren’t the most inspired, but laid-back Barack Obama is our favorite Barack Obama (now that three-term president isn’t an option). But the SonyCrackle superhero cartoon could very well call upon the former chief executive to help Rex and the rest of the crew battle some antagonist—maybe a racist, orange-colored, anti-science Peep?—when the episode airs Thursday, August 16.